For those who still read this article, who clings and is ready to make a lot of sacrifices and get out of their comfort zone, I will try in 4 blog posts to explain the big steps. At Flyos games, we see the development of a board game in 3 steps. Each of these steps is important. They all have a simple objective and a specific timeline Nothing prevents you from starting right now looking for ways to deliver your game or grow your community. However, I advise you not to start building your crowdfunding campaign until you have a physical prototype in your hands. This schedule allows you to be more agile and not to dwell on distant details and to worry about what will make you move on to the next step. The rest of this article focuses on the attitude that I advise you to keep throughout the different stages. The quality of your game will allow you to build credibility. Long-term planning will be more viable than trying to make a quick dollar. You must be passionate about what you do and give your maximum. Kiwetin managed to convince 1357 strangers that two friends with zero experience in creating a board game could do it. Today again I am surprised. We were very naive and had a lot of luck. We were aware of our inexperience and that from the beginning we had to make choices. You can't make a perfect game at first, but nothing prevents you from trying. Before Kiwetin, we wanted to make a fantastic medieval game with a complex and immersive history. It was too complicated and the margin of error too big. We then decided to aim to simpler and more precise gameplay. 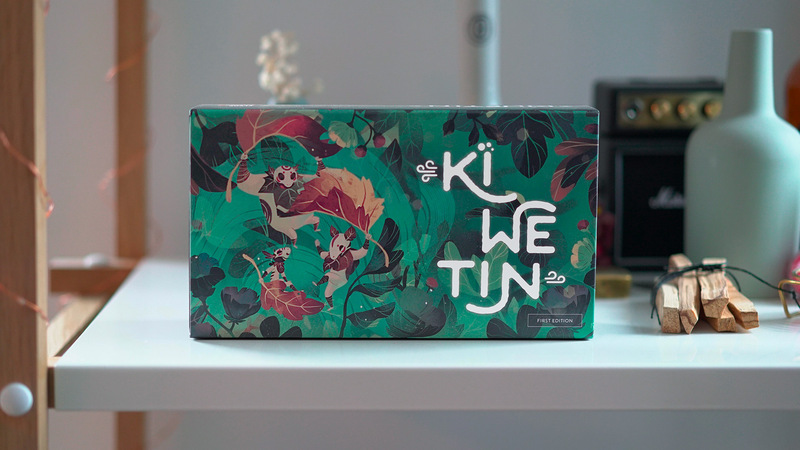 Kiwetin will be a beautiful, fast and fun game. We therefore needed to plan a recurring experience around these three pillars. So each of our backers had to experience that the game was beautiful, fast and fun; and so much for our first idea! Our advantage at Flyos Games is that we are almost 100 % independent. Gary is creative director, so the visual side of the products is in very good hands. As for me, the operations manager, I'm a communications specialist. We have known each other for + 15 years and have thousands of hours of board game, video games and role-playing. We're both passionate. We have therefore very quickly been able to separate our tasks and move forward together but with different timetables. Last point: you will fail. Nothing will prepare you for Europe's obscure certifications or the problems of shipping from China. No article by Jamey Steigmaier (as important as that may be) will replace the experience of translating a German custom slip. You're gonna be naked, judged, in front of everyone. You're gonna make mistakes and make bad decisions. Do your best, be honest and be transparent. Because even if it is really outside your comfort zone, nothing will fill you more with joy and give you more motivation to hear and read the sincere thanks of your backers.